Brief History of Sweet Springs. Author not stated, Lynn? Sweet Springs is located at the foot of Peter's Mountain in historic Monroe County, West Virginia. It was settled by several prominent families; one of them was the Lewis family, descended from John Lewis, pioneer and Founder of Augusta William Lynn Lewis, son of John the founder of Augusta, came to Sweet Springs, obtained large land grants and settled first at Sweet Chalybeate, once known as Red Springs, about a mile from Sweet Springs. William then built a stone house behind the present mansion called Lynnside. He had planned to develop a town to be called Fontville that would be a center of culture and learning. They built a resort around a spring and developed it as a spa. The mineral water was said to have many healing qualities and it was quite popular as one of the spring resorts frequented by the fashionable people of the day. Many famous people were said to have come there, among them Jerome Bonaparte, Robert E. Lee, George Washington and numerous other notables of that time. The resort, known as "Old Sweet" did well until the Civil War intervened. After automobiles became more numerous, the spas lost much of their popularity and Old Sweet was eventually sold to pay off some indebtedness of the owners. It changed hands several times before being bought by the State of West Virginia as a T.B Sanitarium. That venture was not successful, so it was turned into a home for the elderly and was operated for several years until it was closed in the early nineties, operated briefly by Monroe County as a drug rehabilitation facility. After a short period, that project was abandoned and the buildings stood empty and in declining condition before being bought by some investors who plan to restore it to its former position as a fashionable resort for people looking for beautiful surroundings, with a choice of many popular and healthful activities and gourmet meals. 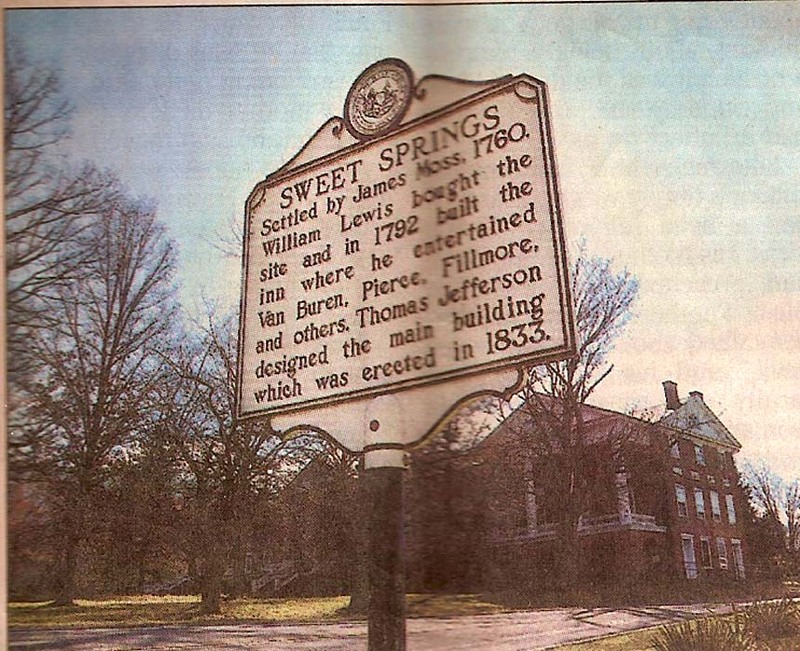 The first settler of the Sweet Springs area was James Moss who disposed of his rights to his land around 1774 to William Lewis, brother of General Andrew Lewis and son of John Lewis, founder of Augusta County, Virginia. William Lewis was given a land grant by King George III for the Sweet Springs area, probably part of the 8000 acres, which was his share of the estate of his father, Colonel John Lewis.. He could not make the land grant permanent till 1774, after which, he moved his family there in 1784 and became known as William Lewis of Sweet Springs. The land remained in Lewis hands for several years until John became involved in a large debt which led to several deeds of trust for the property, including Sweet Springs. When the debts were not paid on time, various tracts were sold and Oliver Beirne became owner of the Sweet Springs tract on August 18, 1852. The land changed hands several times with transactions between Oliver and Christopher Beirne, and Allen T. Caperton. John B. Lewis gave deed of trust to a Mr.Laurens for $10,000 debt, a portion of which was taken over by John's brother, William L., who received a deed of trust for 1,000 acres of the Sweet Springs property as security for $9,000.. John found himself in debt for $34,555, excluding a debt owed by both John B Lewis and James L. Woodville for $5,526.25. As a result of these debts, the Sweet Springs property was put up for sale and was purchased by Oliver Beirne. A few weeks later, Beirne sole half the property to Allen T. Caperton and Christopher J. Beirne, giving each of them one fourth of it.. These three men constituted the Sweet Springs Company. Then on October 12, 1858, Allen Caperton sold the land at the headwaters of Dunlap Creek, known as the Sweet Springs tract to Oliver Beirne. This land contained several tracts, one of them being the 184 acres on which the hotel buildings stood and another tract of 219 acres and a 245 acre tract, all(both) of which joined the first. Oliver Beirne, Allan T. Caperton and Christopher Beirne bought this in 1857. Around 1834, Dr. Lewis replaced the cabins with a huge two-story brick building. It was 250 feet wide and forty feet deep. The upstairs contained thirty-six bedrooms, each around fourteen feet square.. The dining room on the first floor was 160 feet long.. The plans for the hotel, built in 1839, appeared to have been drawn by Thomas Jefferson. This is disputed by some, but the resemblance is obvious. John B. Lewis was forced to sell the hotel for some unknown reason. On December 15,, 1903 the property at Sweet .Springs was sold to the Old Sweet. Springs Company headed by Charles C. Lewis, Jr. If not paid for, the land was to go back to Oliver Beirne, and that was what happened on February 7, 1917 , Charles Jr. son, John D. bid in the resort for his father for $60,000 In 1920, John D. sold 610 acres to C.H. Paxton for $69727.60 cash. The resort was sold several times before being bought from D.M. Taylor of Roanoke, to be turned into a TB sanitarium. That venture was not successful and the property was opened again in 1945 to be used as a home for the elderly and was known as Andrew S. Rowan Memorial Home. It was eventually turned over to Monroe County for a drug rehabilitation facility. That venture, too, proved to be unsuccessful and the property changed hands several times again before being purchased by some investors from Fredericksburg, Virginia, who were interested in restoring it to its former condition and prominence. See Julie Register's lengthy, well-illustrated 2011 essay about the Sweet Springs Resort here.